Facebook Inc. is framing its new ad preference feature as a victory for users – one that will give them more control over the ads they see – but also giving advertisers reason to celebrate. 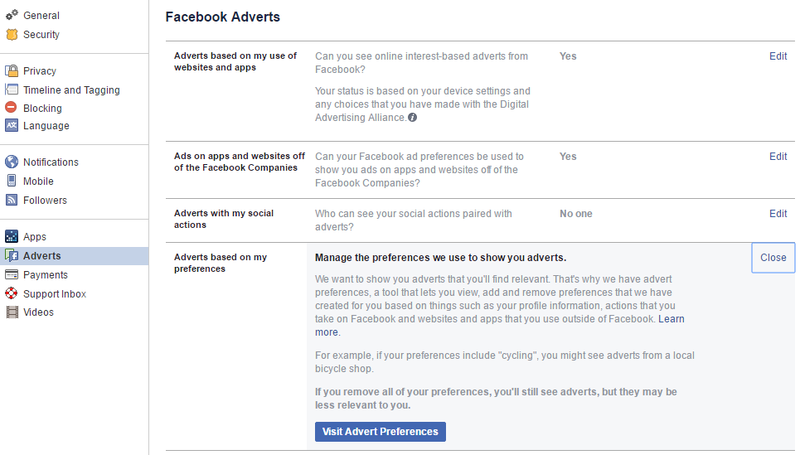 Though users will be able to opt out of – or into – ads related to subjects of their choosing, they will no longer be able to use ad blocking software such as Ad Muncher or AdBlock Plus to shut them off completely. “When they’re relevant and well-made, ads can be useful, helping us find new products and services and introducing us to new experiences — like an ad that shows you your favourite band is coming to town or an amazing airline deal to a tropical vacation,” Andrew Bosworth, vice president of Facebook’s Ads & Business platform, wrote in an Aug. 9 blog post, noting that the new feature was a response to Facebook research indicating that consumers don’t like ads that are irrelevant or disrupt their experience, and would like control over the types of ads they see. From there, users can browse subjects such as “business and industry,” “family and relationships,” and “news and entertainment” for topics they are currently receiving ads about – and click the “x” next to the ones they no longer want to receive. 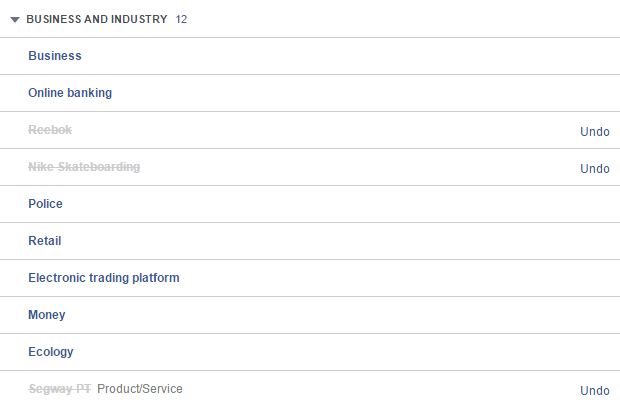 Apparently Facebook thought I was interested in Nike, Reebok, and Segways for some reason. The company is also adding tools that allow users to stop seeing ads from businesses or organizations which have added them to their customer lists – giving businesses additional incentive to produce entertaining, relevant, and non-intrusive content. “We’ve all experienced a lot of bad ads: ads that obscure the content we’re trying to read, ads that slow down load times or ads that try to sell us things we have no interest in buying,” Bosworth wrote. “Rather than paying ad blocking companies to unblock the ads we show — as some of these companies have invited us to do in the past — we’re putting control in people’s hands with our updated ad preferences and our other advertising controls,” Bosworth wrote. The truth, of course, is that the majority of consumers don’t like ads, which added more than $5 billion USD to Facebook’s revenues last year: U.K.-based Juniper Research has estimated that ad blocking software will cost publishers $27 billion USD in lost revenue by 2020, and even in the mobile space, an estimated 420 million smartphone users have installed an ad blocker of some kind. On the bright side, Facebook’s new feature – which allows users to add topics they would like to see ads for as well – means that when consumers do see your ads, they’re more likely to be receptive to your message.